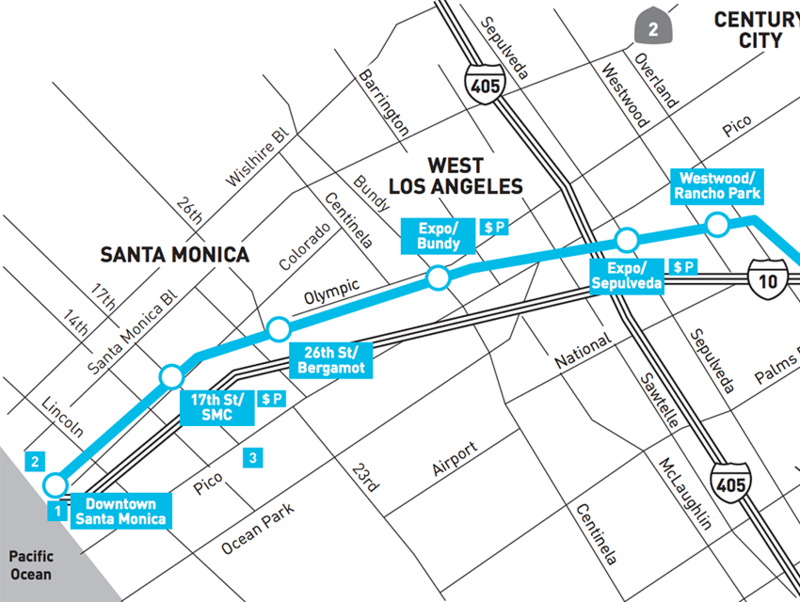 Two weeks from tomorrow, the Expo Line extension opens for business, offering a new way to get across town without fighting the 10 or hoping Olympic won’t disappoint you. Metro recently released the new line’s schedule, which includes some juicy nuggets. Thanks to a paucity of new light rail vehicles, trains will initially come every 12 minutes. Some are griping that those frequencies—also called headways—are too infrequent for the number of riders expected. Likely true, but the headways are expected to shrink as more trains arrive (which is happening as we speak). For the morning commute: a westbound train departing the 7th/Metro at 8:01 a.m. should arrive at the downtown Santa Monica station at Fourth and Colorado at 8:51 a.m.; at 50 minutes, that’s four minutes longer than the 46 minutes Metro was initially promising. Traveling east is quicker: an 8:06 a.m. train out of Santa Monica arrives at 7th/Metro at 8:53, which is only 47 minutes. Not too shabby. Trains in the afternoon—where traffic is generally worse—will have the same 50/47 minute schedule. Coinciding with the start of service, free rides begin on Friday, May 20 at noon and continue until about 2 a.m. early Sunday morning. Saturday will see a host of parties at stations along the extension, as well as the currently-operating Culver City stop. On Sunday, the Pick Pico street fair, near Overland, will coincide with opening weekend.